Home » Wireline Services » Category: "Completions"
» Renegade Wireline Services Completions. Choosing the right oil/gas service company for your well-site can be challenging; mistakes can be costly. Completions operations play an essential role in determining the economic benefits of a productive well. You need an efficiently-managed process from start to finish to prevent bottlenecks and ensure the job is done correctly the first time. Renegade combines technical expertise and excellent vendor relationships to bring you the most effective completions services. Save yourself time, expense, and frustration by getting the right service provider from the beginning. The Renegade advantage: we make sure we assemble the right crew for every job. Rather than depending on outsourcing certain tasks to third-party workers (whose skill levels may be unknown or unpredictable), we hire and thoroughly train our own operators for each role. In addition, our service crews have 24/7 access to all the best industry knowledge. By having control over every step of the completions process, we guarantee expert results. Renegade Services is driven by the pursuit of excellence and efficiency. The existing modern completions tools often fail to sufficiently address the needs of the industry. When the right tools for a job aren’t on the market, we create the tools. Even though the process of well completions doesn’t seem like it can change that much over time, it can and it has. Technology touches everything, and the oil and gas industry is no exception. Renegade Wireline Services is on top of all the latest technological developments to help you make your process more efficient and productive. Thanks to the use of the best new technology available, we can make the pump-down process more effective and less prone to errors and complications. Being eco-friendly is an increasingly important factor in completion operations. Renegade Services improves upon the conventional line which requires pumping grease as a means to maintain pressure control. Using a greaseless line eliminates the usual mess. Not only does this make the pumping stage of the process simpler and less complicated, but it also keeps the worksite cleaner. Say goodbye to community concerns about the environmental impact of wellhead construction. Renegade Services offers a proactive solution that naturally addresses these concerns. Blowouts are one of the worst potential catastrophes that can happen. Well-site operators want to do anything they possibly can to avoid one. We address this problem proactively by offering top of the line pressure control services. Maintaining proper pressure control on-site prevents accidents. Our trained operators know how to safely control well pressure, rather than letting it build up to the degree that it can become dangerous. 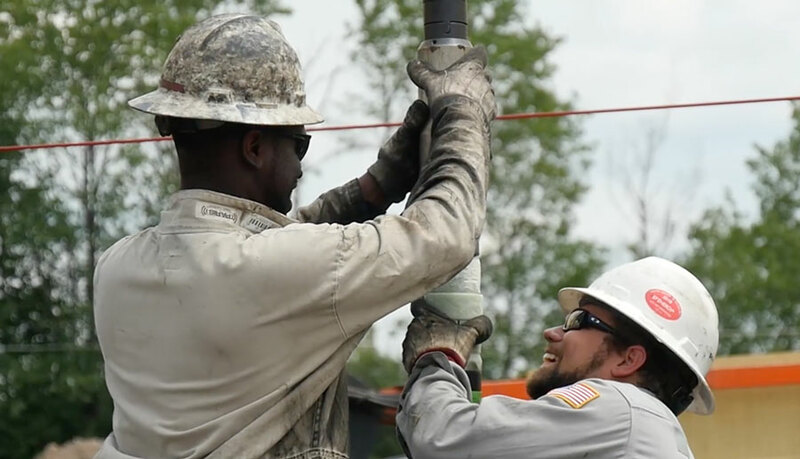 Renegade Wireline Services not only solves problems—we prevent them. By having the right combination of equipment, highly trained operators, and a well-functioning crew on location, we anticipate problems before they occur. You spend less time locating and managing a group of crew members and the tasks that need to be done. Leave it all to us and you can count on the job being done with a level of efficiency and expertise better than you imagined possible. With 45 units (as of June 2018) passing through the hands of their trained operators, Renegade Services, the largest independently owned wireline company in the USA and the leading service company for RigLock®, has seen the groundbreaking impact of this true innovation first hand and is currently running them for their own major competitors. Renegade’s hydraulically actuated wireline grab is the latest game-changing device to be rolled out by the ever-evolving minds of Renegade Services. HAG1℠ is the first device of its kind that uses a setting tool to collect the wireline in its jaws. Pressure plays a crucial role in completing a well. You need the right equipment to make the entire system succeed, from lubricator assembly to the grease head. Injecting a type of grease between the cable and flow tubes in the grease head is necessary in order to maintain a seal with conventional wireline. Unlike conventional line, the coating on greaseless cable reduces line friction caused by the cable rubbing on the inside of the casing. Digital technology meets the completions industry. The latest software guides the perforating process with the help of computer precision. Wireline operations depend on having a well-trained and organized crew. A qualified crane operator plays a crucial role in a successful wireline crew. The ART-H is intended for use in horizontal and highly deviated wells in conjunction with down-hole tractor devices where the controllable release of all or part of a stuck tool-string is required. The tool can replace the able weak point, thereby improving operational safety. Today’s highly commoditized NAM frac industrial drilling rigs are being pushed to finish wells faster, which often leads to the wellbore not being as straight and precise as necessary. This directly affects pump down operations by introducing severe doglegs and toe up conditions.